What if a 10-to-40 nanometer-sized particle of elemental silver (Ag) represents the magic bullet to reduce human infection with cutaneous leishmaniasis, a vector-borne parasitic illness that affects 12 million people globally? With advances in nanotechnology, this futuristic silver particle may soon become a reality. Cutaneous leishmaniasis is found on every continent except Australia and Antarctica. Between dusk and dawn, sandflies, which are one third the size of a mosquito, transmit this deadly parasite. The infected sandfly injects the promastigote, the infective stage of leishmaniasis, during a blood meal. Cutaneous Leishmaniasis lesions, which take months to develop, slowly erodes the skin, disfiguring the individual. Soldiers from Iraq and Afghanistan refer to the parasite as the “Baghdad Boil.” Treatments for this infection have numerous side effects, and resistance to medications is on the rise. The utilization of silver, copper and gold nanoparticles as an effective treatment for Leishmaniasis represents a fascinating new development in the field of biochemistry. With unique chemical properties and a large surface area, metallic oxide nanoparticles act as successful antimicrobial agents. Not only do they produce reactive oxygen species (ROS), which successfully kill bacteria, viruses and parasites, but there is also a direct cytocidal effect on the bacterial cell wall, making these chemicals highly effective. When researchers utilize silver nanoparticles with ultraviolet or infrared light, a further reduction in parasite numbers occurs. Silver nanoparticles represent a novel technology to successfully treat the promastigote stage of cutaneous Leishmaniasis. This developing biomedical nanotechnology may revolutionize treatment by targeting a vulnerability in this protozoa not addressed by traditional chemotherapy, decreasing the protozoa load and successfully preventing parasite survival in a human host cell or macrophage. The current use of silver nanoparticles may play a remarkable role in decreasing human morbidity from this parasite, which afflicts 1.5 million individuals a year. As chemotherapeutic agents targeting promastigotes are limited by significant side effects and potential resistance by the parasite, silver nanoparticles produce reactive oxygen species, a unique and distinct pathway for effectively targeting the promastigote. 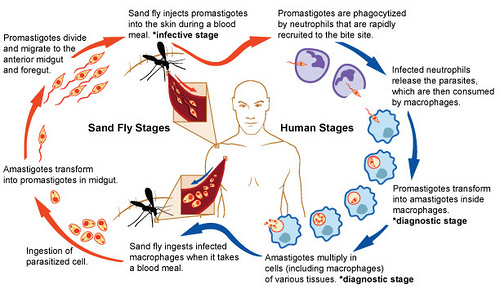 Sandflies acquire the infection during blood meals and the amastigotes develop into promastigotes in the sandfly gut. Transmitted by the bite of the female phlebotomine sandfly, this infection results in elevated macrophage production and phagocytosis of the promastigote, which then transforms into amastigotes that multiply, infecting other phagocytic cells in the blood stream. Initially, leishmaniasis was treated with antimony compounds, such as N-methylglucamine antimoniate, however serious side effects from this drug may affect gastrointestinal, cardiac, renal and respiratory function. Other traditional medications including pentamidine, amphotericin B, as well as paromomycin, may result in significant hypotension (low blood pressure) as well as nephrotoxicity. Resistance by the parasite to the above mentioned drugs has increased over the past two years. Vaccine development so far has resulted in low success and novel therapies with low toxicity, including silver nanoparticles are needed. A silver nanoparticle is a well defined aggregate of silver (Ag) in the zero-valent state. With a large surface area, as well as high chemical reactivity, this aggregate produces reactive oxygen species (ROS), which successfully kill the Leishmaniasis parasite. The catalytic oxidation reaction caused by the reactant, metallic silver molecules and subsequent reactions with dissolved single valent silver ions, may produce the ROS. In addition, the silver nanoparticles individually, or in an aggregate, may have a poorly understood direct microcidal effect. Silver nanoparticles may also impair the functional activity of deoxyribonucleic acid (DNA) and induce programmed cellular death, or apoptosis, in bacterial cells. Cellular biological parameters including growth, metabolic activity, and infectivity of the leishmania promastigotes all decrease when exposed to silver nanoparticles. So far, these studies involve in vitro tests; additional developments of oral nano formulations have not been explored and may be very expensive. Conversely, metal oxide nanoparticles may be toxic at high enough concentrations on human fibroblast, macrophage, kidney and liver cells. Concerns about potential toxicity and reducing manufacturing costs of metal nanoparticles are valid, and merit further investigation. Additionally, a more efficient antiparasitic effect has been noted upon exposing the silver nanoparticles to ultraviolet light. Moreover, when silver nanoparticles are exposed to ultraviolet light in vitro, and combined with the leishmania protozoa, all biological activity of leishmaniasis stops. This is thought to occur secondary to the release of silver ions, as well as an increase in the production of ROS. The amastigotes appear more sensitive than the promastigotes to the silver nanoparticles, although the latter lose their shape, as well as their internal organelles. However, in the presence of ultraviolet light, the membrane of the promastigotes was disrupted and scientists observed a significant anti-leishmanial effect, measured by proliferation and metabolic activity of the promastigote. The anti-leishmanial effect of silver nanoparticles increased from 1.5 to 3 fold in the dark to 2 to 6.5 fold under ultraviolet light. In addition, amastigote survival in host cells decreased when ultraviolet light was present. Not all effects have been positive for silver nanoparticles. Direct cytotoxicity of the silver nanoparticle on the macrophage itself has been observed. Ultraviolet light may harm human tissues and cells, which may be a limitation when applying this system of nanoparticles plus ultraviolet light to humans. However, similar antiparasitic effects have been noted in the presence of visible light, and the effect is almost the same as ultraviolet light in terms of decreasing the number of viable promastigotes. Innovative modifications of nanoparticles include grafting titanium oxide nanoparticles with a dense polymer brush, which are harmless to fibroblast cells, yet appear to maintain their inhibitory effect. In one experiment with TiO2 nanoparticles exposed to fibroblast cells, the nanoparticles are noted to both directly penetrate the cell membrane, as well as undergo the process of endocytosis and become vesicles in the cytoplasm, where they also rupture the nuclear membrane, either as an intact or as a ruptured vesicle. The nanoparticles also appear to have a direct effect on actin subunits, decreasing contraction, and on collagen, reducing the surface area of the cell. A particular challenge for targeting leishmaniasis has been its presence in leukocytes, or white blood cells, which are difficult to target with traditional chemotherapy, however, nanocarriers have the ability to overcome biological barriers and improve selectivity for the parasite. The interaction of silver nanoparticles with the promastigotes and the decrease in protozoal numbers is also secondary to interaction of the nanoparticles with parasitic surface lipophosphoglycan and glycoprotein molecules thought responsible for how the parasite gains entry to infect the macrophage. Leishmania parasites are sensitive to ROS, but when the promastigotes multiply in macrophages they overcome the enzymatic biochemical mechanism responsible for ROS production, and may escape deterioration. With a large surface area and the production of ROS not dependent on the macrophages’ enzymatic activity, nanoparticles can successfully overwhelm the defenses of the parasite. Although nanoparticles are versatile, concerns about their toxicity remain significant. As vaccine development is at a standstill currently, silver nanoparticles and other metal oxide nanoparticles that act as drug carriers for anti-leishmanial drugs such as amphotericin B and may be the wave of the future. Further work is also in development to limit the spread of leishmaniasis by controlling the vector: the sandfly. By exposing the sandfly to silver nanoparticles, a decrease in numbers of the parasite may result by the direct interaction of parasitic surface lipophosphoglycans-a site thought to be locally important in infectivity. Promastigotes, the infective stage of cutaneous leishmaniasis, may soon be eliminated by a small silver bullet: the silver nanoparticle. The inherent toxicity of this noble metal nanoparticle itself, as well as its inherent ability to produce reactive oxygen species, amplified in the presence of ultraviolet light, presents an innovative method for eradicating cutaneous leishmaniasis. This ability far surpasses the chemotherapeutic agents utilized previously which met with resistance as well as significant, negative side effects. Several in vitro experiments have demonstrated successful decreases in the parasite load by exposure of promastigotes to silver nanoparticles, although an in vivo system is not yet functional. ROS are present in host macrophage cells, however, their production by enzymatic pathways is easily overwhelmed by the promastigote. Increasing the amount of ROS, by adding silver nanoparticles in vitro, appears to effectively lower the parasite load. Not only does the silver appear toxic to the parasite itself, but also the ROS decrease the infectivity by targeting the parasitic cell membrane. Limitations of these silver nanoparticles, however, have yet to be overcome. These include the toxicity of the nanoparticles themselves, which have shown harmful to various human cell types. Modifications including a dense polymer brush grafted onto the nanoparticles has shown some promise in nullifying toxicity. Further work is necessary in forging a nanoparticle system that is benign to human cells, but maintains its inhibitory effect ideally in an in vivo system. As Isaac Newton, the alchemist, noted when he saw the Tree of Diana, which was made up of twig like branches of solid silver created by the immersion of silver amalgams in nitric acid, metals “posses a sort of life.” This saying still holds and has come full circle with the silver nanoparticle.